Almost every day there is something in the media about the carriage horse issue in New York City. During his election campaign last year, Mayor Bill de Blasio promised to ban horse-drawn carriages in New York, but we are still waiting. Will the bill be introduced this month or next, or do we have to wait for the new year? If the Mayor does not do as promised, it could hurt him politically and he will be seen as a flip flopper. Let's hope that is not the case and when the bill is finally introduced, it has weight and is something we can support. We also hope the Mayor's office gets behind it and fights for it with gusto. We do not want inaction and a shrug of "well, I tried but the Council does not support it." We will not buy that. The Wall Street Journal recently addressed our frustration and compared it to other issues. In the meantime, the carriage trade has had more than one year to strengthen their argument; to create lies that are picked up by the media as truths with no one to counter them. They range from how "spectacular" the stables are; how they have virtually no accidents or dead horses; to the age of their industry (see our blog CarriageHorsesNYC, which addresses many of these issues). The media is firmly on the side of the carriage trade. Why is anyone's guess, but it is not because they love the horses or care so much about the drivers or because it is a tradition that New York simply cannot do without; I do not buy that. I suspect the Daily News, which has led the charge, is using the carriage horse issue as a metaphor for their dislike of de Blasio's progressive agenda. Its publisher, Mort Zuckerman, had previously enjoyed access to City Hall under Michael Bloomberg. Don't believe anyone who tells you the horses "love" their jobs. The living and working conditions of the carriage horses are inhumane and unsafe. Horses are gentle, sensitive creatures who are trained to obey, some abused emotionally and sometimes physically into submission. That is the New York carriage horse, standing at the hack line waiting in the hot burning sun without shade, or their hooves immersed in cold snowy slush, looking dispirited and zoned out. The City Council does not have to show any compassion for the horses. But they should be concerned about the public's safety. They need to remove their blinders. 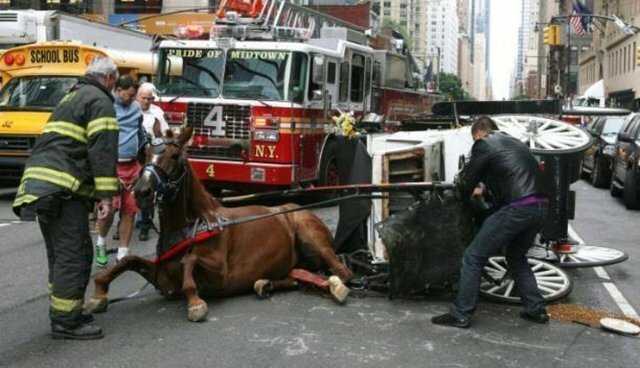 Each day that another huge 1,500 to 2,000 pound horse is put on the street to work in the middle of traffic is taking an irresponsible risk. The very nature of these majestic animals makes them unsuitable to be pulling flimsy carriages in one of the most traffic congested cities in the world. Horses are prey animals, which means that they can be spooked at the slightest provocation. Sudden unfamiliar movements or loud noises can trigger an innate anxiety in a horse, which may lead to panic and fear. Their strength and size make them uncontrollable, unwitting weapons: when they bolt into traffic, they can injure or kill both themselves and passersby. There have been many such accidents in New York but that has yet to convince our City Council to take action. Recently in Germany, a cart holding 15 women and pulled by four horses overturned because the horses spooked and bolted. Many were injured. 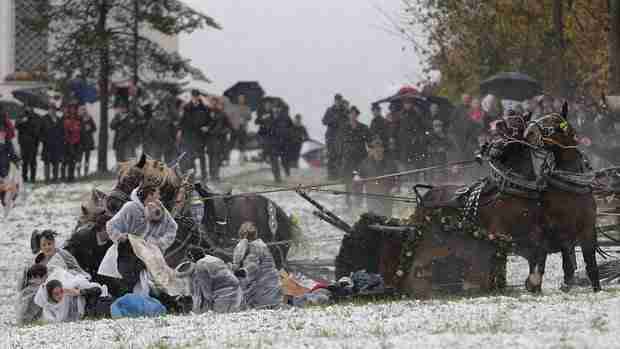 The image of the women, cart and horses scattered about the snowy ground was bizarre. Yes, it is extremely important to understand a horse's nature. In New York City, when a carriage horse spooks, as many have, his days are numbered. He will most likely be "retired." Such was the case of Chris, (featured in the header image) who showed up in the system in June 2013, had an accident on September 26 of that year and was then shipped to Pennsylvania the next week on October 3. Last summer, Pumpkin spooked at the hack line on June 9, and by June 30 he was history. Are these horses still among the living? The owners take no responsibility for them, and it is anyone's guess. They are simply commodities, a means to an end. So we'll continue to wait, sometimes not so patiently, to see if the Mayor will keep his promise.